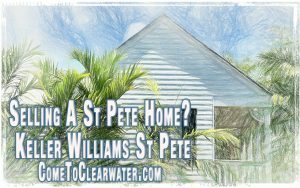 Selling your home in St. Pete? 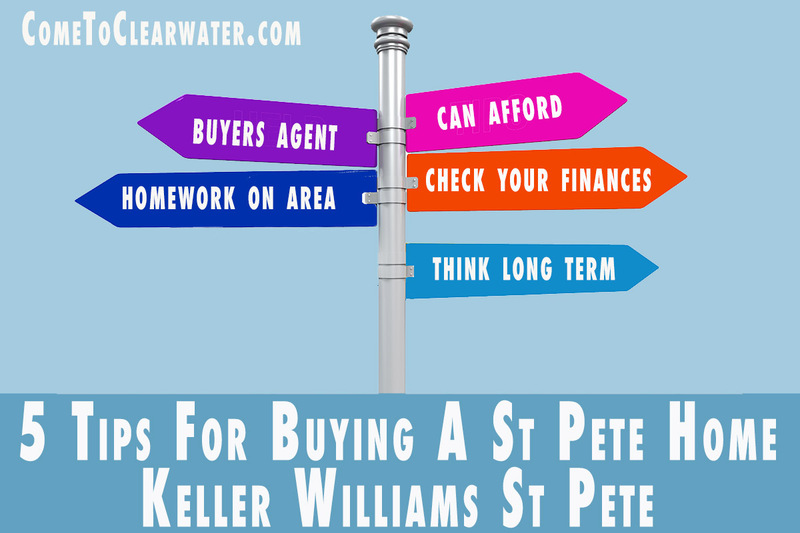 Whether it’s downtown St. Pete or the St. Pete beaches, Keller Williams in St. Pete knows the area inside and out. From homes and the buyers who want them to the community, Keller Williams St Pete can sell your home for the best price and to the perfect buyer. The Realtors at Keller Williams St. Pete will start by talking with you about your expectations, situation and future plans. Knowing your wants and needs will help them give you the best service. 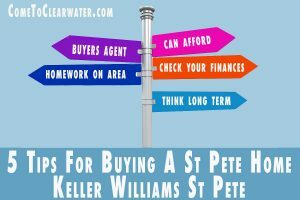 Remember that Keller Williams St. Pete represents you and although they are happy to help buyers, your needs and wants are their responsibility. First, they will do a complete and custom evaluation of your home. From a detailed walk through to gathering comparisons to other homes that have sold that are similar to yours. This is key in figuring out the right price to meet your wants and needs. Your Keller Williams Realtor is there to help you through the process and provide you with the knowledge you need to make the best decision in the sale of your home. Since they know the community so well, they will be that local expert for buyers who will advocate for your community, neighborhood, schools, shopping, restaurants and trends. How does that assist you? By providing the highest level of advocacy for the sale of your home. You know your neighborhood. You know how awesome it has been to live there. Hire a Realtor who understands that and will use the same passion in the listing, showing and sale of your home. 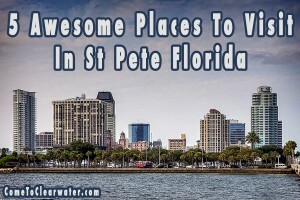 St. Pete is a fantastic area. Help someone else find that out by listing your home with Keller Williams St. Pete. You won’t regret it for a second. So you want to buy a St. Pete home. It’s a great area, but you know that home buying can be stressful. Here are some tips to make your home shopping easy breezy. Before you ever walk through a home or talk to a Realtor, check your finances. Know your credit score, check all credit reports with the big three (Experian, TransUnion and Equifax). If you find mistakes or misreports, work to correct them. If you have a lower score or issues on your credit report such as late payments, charge offs or bankruptcies, take a few months to work to improve your score and report. Also work with a lender to get pre-approved for a mortgage. A pre-approval will be a huge plus when you are ready to make an offer on a home. Of course, be sure that you know how much home you can afford before you look. One thing a Realtor will ask is a price range to start a search. A good rule of thumb is that your home should cost about 2½ times your annual salary (or combined annual salary if you are buying as a couple. BUT, keep in mind other factors like your current expenses, utilities and taxes for the new home. Be sure that you can afford the home you want. Don’t pollyanna yourself into thinking you COULD BE making enough, be sure it IS what you will be making. Hire your own agent to help you search. Using a buyer’s agent will protect you. Don’t fall into the trap of thinking a seller’s agent will have your best interests at heart. As nice as they will be, their loyalty is to their client, the seller. Check into different neighborhoods, school districts and such. Check on sales from the last few months for homes in those areas. That way you know the fair pricing and have an idea of how you should bid on homes you see and want to purchase. Also keep in mind that you should be thinking long term. If you are newly married, or planning to be married, chances are you will be in this home when you start your family. So schools are important. Also pay attention to whether a seller has done a pre-sale inspection and ask to see a copy of one for homes you are very interested in. That way you have an idea of any expensive repairs that might become necessary. You’re looking for waterfront homes and St. Pete sounds like heaven, and it can be. Living at the water can be fun in the sun. Beach, boats, jet skis, sun. Sounds great, but there are things that you need to consider before buying your St. Pete waterfront home. You’ll need insurance for each. The west coast of Florida may not happen as often as the east coast, but they happen and often enough. Coverage for floods and hurricanes are not part of homeowners policies. If there is a hurricane and/or flooding, your homeowners won’t cover the damage. Having all 3 policies is necessary, and a necessary expense to consider. Those floods and hurricanes also cause erosion. Whether your home is beachfront or just waterfront, erosion changes your property. If you benefit from eroded shorelines by being the depository, great for you, but what if you’re the property losing beach or waterfront? It changes your property value, and not for the better. Keep in mind that while beachfront or waterfront property is more expensive, it also appreciates more than the less expensive properties further from the beach, or in communities without beachfront or waterfront. Whether you want to purchase a property as an investment or as your home, you never want to lose value. Make sure that you have a home inspection by someone who is very familiar with waterfront and beachfront properties. They have special issues with water, humidity and salt damage beyond the usual home owning issues. Also get yourself familiar with ways to protect the home you’re looking to make your own from those same issues. 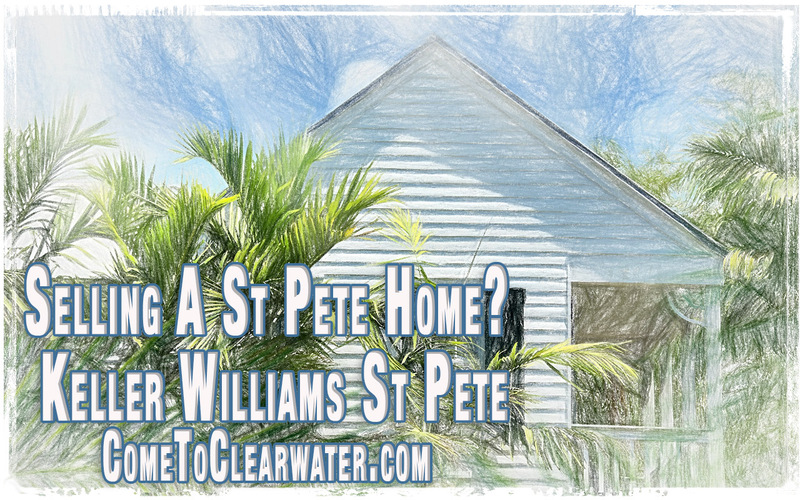 Don’t be afraid to make a waterfront home in St. Pete your own. Just know what you’ll be getting into! 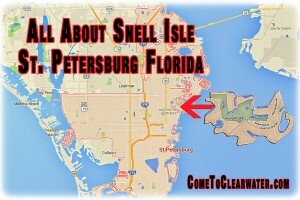 St. Petersburg Snell Isle, Florida is a great place to live. It has great neighborhoods and one of the older neighborhoods is . Snell Isle has always been a higher end neighborhood, and today is no different. Snell Isle was established in the 1920’s when a local developer, C. Perry Snell, developed a portion of what Snell Isle is today. C. Perry Snell was a druggist from Kentucky. He moved to the St. Petersburg area in 1900 and began purchasing properties in the area to develop. Those properties were then developed into upscale neighborhoods, commercial areas and also public parks. Snell Isle was one of those neighborhoods and it was named for him. Snell Isle was originally a typical muddy mangrove island. By the time the neighborhood officially opened in 1925 there was only 39 acres above the high tide line. Of those 39 acres Snell still managed to sell over seven million dollars worth of lots. Today there is 275 acres above the high tide line and homes still sell in the millions. In 1926 The Renaissance Vinoy Golf Club and Resort opened on the island. It is still there and is currently on the National Register of Historic Places. It’s also the home to the St. Petersburg Woman’s Club, which Snell built on Coffee Pot Bayou. There is a memorial on the island to Snell, its founder. So come check out the Isle when in St. Petersburg. Coffee Pot Bayou in St. Petersburg, Florida is a great place to visit if you like homes with character and the sight of endangered animals. 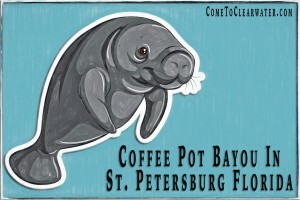 One of the things that Coffee Pot Bayou is famous for is the fact that manatees winter there. In the colder winter months the Gulf gets too chilly for the manatees so they move inland where the waters are more shallow and warmer. Mothers and babies hang out and the locals adopt them as their own. As spring gets closer males and females court and mate before moving back down to the Gulf for the warmer months. Along with the manatees you can also see Great Blue Herons and Great Egrets, Green Herons, and Laughing Gulls. Add in a few Red-ear slider turtles, a dolphin or two and watching the wildlife is fun for locals and visitors alike. Once manatees were deemed a protected species, Coffee Pot Bayou became a lot more popular due to their winter swimming grounds. Coffee Pot Bayou, which is part of St. Petersburg, has a broad sidewalk that is part of a 2-mile walking/biking path that extends from downtown St. Petersburg and follows the edge of Tampa Bay before entering Coffee Pot Bayou. It’s well lit and a safe place to amble along and watch the wildlife. There are fantastic views of flora and fauna, comfortable benches for resting, access to a small beach off of North Shores Park, and even places to fish. So if you’re staying in St. Petersburg or the Tampa area in the winter, head on over to Coffee Pot Bayou and enjoy the views. If you’re planning a vacation in the St. Pete Florida area, there are some great places to visit. The beaches, of course, go without saying. After too many sunny beach days you might want to take a break and do some indoor activities. Not to worry, there’s plenty of that and plenty of ways to keep all kinds of interests engaged! One great place to visit is the Museum of Fine Arts located in the downtown waterfront. Rest your skin and instead soak in the beauty and history the MFA offers. They have a large permanent collection and many different traveling exhibits. Some exhibits showcase 4,500 years of civilization with many objects from antiquity to today. Drink in masterpieces from Monet, Cézanne, Renoir and more, as well as enjoying the Steuben glass gallery and sculpture garden. Enjoy even more art at the Dali Museum. Salvador Dalí’s art is brilliant, but shocking. The museum has the largest collection of Dali works in America. The museum has changing exhibits all year and activities for all ages, from children’s activities to exhibits in film, a music series and lectures. They have guided tours or you can self guide and take your time going through the museum. There is also a Spanish themed Cafe and wander the waterside Avant Garden. Keep the kids happy by taking a trip to the Great Explorations Children’s Museum. The museum is designed for children 10 and under, and is filled with child friendly exhibits to excite them about learning through creativity, play and exploration. Kids can touch, explore and make a mess. what more could your kids ask for? On a more serious note, learning isn’t just for kids. Learning from history is important, and one of the most important learning opportunities is the Holocaust. The Holocaust Museum will remind us all the danger of not learning from history through personal testimonies, official documentation, photographs and artifacts. The museum provides a perfect opening to discuss the consequences of the Holocaust and how we, as freedom loving people, can try and keep it from ever happening again. Whew! After all of that learning and beauty, how about some fun at America’s favorite pastime? Head over to Tropicana Field to watch a major league baseball game. Home of the Tampa Bay Rays, plan your trip around when your favorite team is playing there!